1.2m x 10mm Hardened Square Alloy Steel chain. 16mm x 0.7m length long link chain. 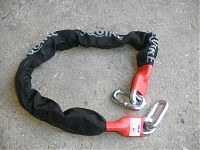 Short length ideal for Bicycles, locking gates, containers etc. 16mm x 1.2m length long link chain. 16mm x 1.5m length long link chain. 16mm x 2.0m length long link chain. Prestige top of the range chain. 16mm x 2.5m length long link chain. 16mm x 3.1m length long link chain.